Charlotte Yarn is a place where anyone from young to old can come together as a community with other Charlotte area knitters and crocheters to learn from each other as well as our experienced instructors. 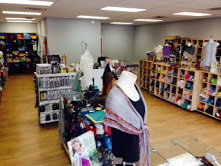 Whether you’re a beginner, an expert or somewhere in between, Charlotte Yarn has everything from unique yarns and supplies to classes for all of your knitting and crocheting needs. We encourage the community to stop by and sit and chat with us, while sharing and learning from fellow knitting and crocheting enthusiasts and experts.